This is an N Scale Dual Crossing Gates Track Section from Bachmann. Retail $17.00 SAVE 37% ! This product is not the complicated electronic version, but it still is a decent operating crossing gate system that can be used on someone&apos;s layout that does not have the electronic skills to construct the more complicated version. For use with all N scale electric trains. A section of Bachmann N scale track runs through the center. front of the railroad tracks. Each side of the road has a black and white striped crossing gate with a railroad crossing sign and transparent red signal light lenses. 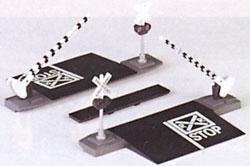 One N Scale Dual Crossing Gates. A little priciey for what it is. Seems a little cheaply made and of below average quality. I will keep it in try to put in one of the little red lights that fell our, but would not recommend this item.